Flextsteel Captain’s Chairs are made with high density, high resiliency foams that provide even distribution of pressure so you stay comfortable during extended periods of driving. 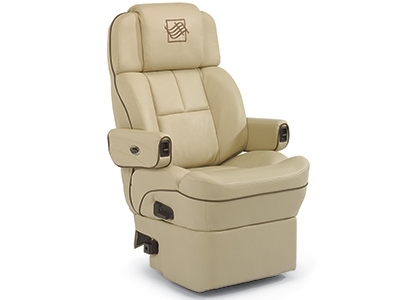 When you’re traveling the country, you’ll be thankful for your Flexsteel Captain’s Chair! Standard Captain’s Chairs –The Standard Captain’s chairs are not pillow tops so they are perfect for those who need or are looking for a firmer chair. When compared to the Deluxe chairs, Standard Captain’s Chairs are budget friendly. Deluxe Captain’s Chairs – These models offer upgraded foams that conform to your body and essentially "hug” you for maximum comfort. Our Deluxe Chair stock include the most comfortable pillow top chairs Flexsteel has to offer! Class B and C Captain’s Chairs – These models are designed specifically for Ford, Chevy and Dodge Class B and C Motorhomes and Vans. We cannot guarantee these seats fit so please give us a call if you have any questions! Browse these categories under "RV Captains Chairs"